The second of this year's annual London Locations Walkabout took place on Sunday 29th October 2006, and as ever the event was both popular and successful, with over 30 fans from all over England and Scotland, and also several fans from the USA, attending the tour, which included all the surviving London-based "Prisoner" locations from the opening sequence and several episodes. 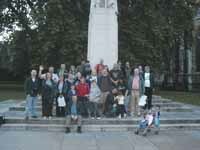 Beginning at Marble Arch and ending at Number Six's London home, taking in around 20 other "Prisoner" locations on the way, a photo report of the tour can be seen HERE. Two more tours are planned for 2007 - keep an eye on the events page for more details.